THE LITTLE MERMAID (2018) is a new live action version of the fairy tale where an orphaned English girl and her young uncle encounter a real mermaid being held captive in Mississippi by an evil magician, who tricked the mermaid into giving him her soul. This LITTLE MERMAID has no crude or explicit content, but the movie is a bit uneven and contains some magical elements combined with positive family-friendly messages. THE LITTLE MERMAID (2018) is a new live action version of the classic fairy tale by Hans Christian Andersen. 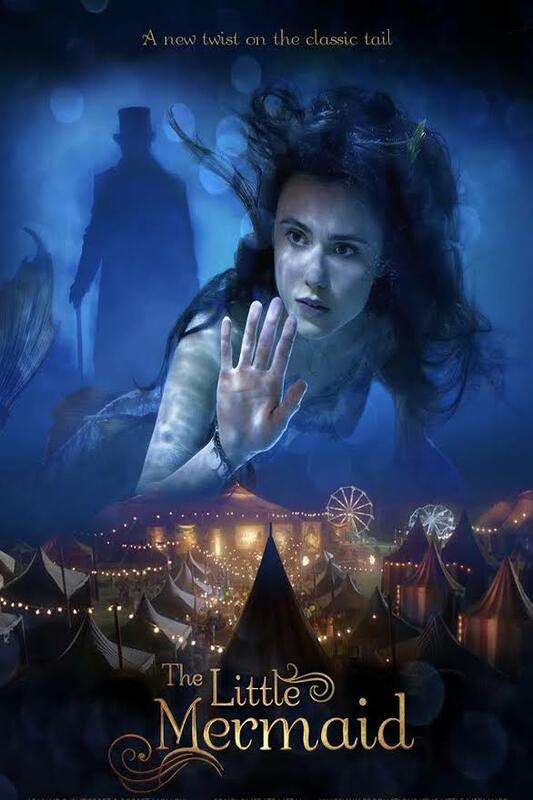 In this version, an orphaned English girl and her young uncle encounter a real mermaid, being held captive in Mississippi by an evil magician, who tricked the mermaid into giving him her soul. This LITTLE MERMAID has no immoral content, but the movie is a bit uneven and contains some magical elements combined with positive family-friendly messages. The movie opens with a grandmother reading the fairy tale to her two grandchildren. The grandmother says that’s not really how the story goes, and the little girls convince the grandmother to tell her version of the story. In the 1920s, an English reporter named Cameron, Cam for short, travels to Mississippi with his sickly orphaned niece, Elle. Cam is there to investigate stories about Dr. Locke, a circus owner who reportedly has a cure-all elixir made from mermaid water. Cam is very skeptical. At the circus, Cam and Elle get their fortunes told by Thora, who tells Elle she has a mermaid’s heart. When they see Dr. Locke perform his act, he unveils a tank of water where a beautiful mermaid is swimming. Cam’s convinced there’s a trick, but Elle believes the mermaid is real. It turns out that Elle is correct. The mermaid, whose name is Elizabeth, is real, but she’s being held captive by Dr. Locke, who tricked Elizabeth into giving him her soul. Cam and Elle set out to free Elizabeth and take back her soul from the evil Dr. Locke. THE LITTLE MERMAID (2018) doesn’t have the big budget Disney has for its live action fairy talks, but it has some nice scenes. Some of the best scenes are those featuring Cam and his niece, Elle, or between Elle and the mermaid, and between Cam and the mermaid. The movie is a little uneven otherwise, however. For example, the special effects are a little cheesy. Also, the villain could be better. Happily, the movie is totally clean of any foul language, crude content, or innuendo. There is some fighting, punching, and kicking when the good guys are tussling with the villain’s henchman, who uses a whip. Also, there is a magic battle at the end between the good guys, including the fortune teller, and Dr. Locke, a powerful magician. Until that battle, the movie makes it seem as if all magic is evil. Finally, this occult fairy tale magic is mitigated by some positive moral messages. For example, at the end, the grandmother says, “Love is the biggest gift.” THE LITTLE MERMAID (2018) also promotes doing the right thing and kindness. Villain holds mermaid captive by tricking her, villain has tricked other characters too, and villain threatens people. THE LITTLE MERMAID (2018) is a new live action version of the classic fairy tale. In the 1920s, an English reporter named Cameron travels to Mississippi with his sickly orphaned niece, Elle. Cameron is investigating Dr. Locke, a circus owner who reportedly has a cure-all elixir made from mermaid water. When Dr. Locke performs his act, he unveils a water tank where a beautiful mermaid swims. Cameron’s convinced it’s a trick, but Elle believes the mermaid’s real. The mermaid, Elizabeth, is real, but she’s held captive by Dr. Locke, who tricked Elizabeth into giving him her soul. Cameron and Elle set out to free Elizabeth and take back her soul. THE LITTLE MERMAID has some nice scenes of Cameron with his niece and with the mermaid. The movie’s a little uneven otherwise. For example, the special effects and villain are somewhat cheesy. The movie’s totally clean of foul language, crude content, and innuendo. There’s some fighting in a couple scenes and a magic battle. This fairy tale magic is mitigated by positive moral messages. For example, THE LITTLE MERMAID (2018) extols love and kindness.